Replaced compatriot Alan Hurst on the Emirates Elite Panel of Match Referees. In an international career spanning from 1984 to 1996, played 107 Tests and 181 ODIs for Australia. He scored 7,422 runs in 107 Tests, including 21 centuries and 32 half-centuries while he hit 5,964 runs with five centuries and 37 half-centuries in limited-overs internationals. 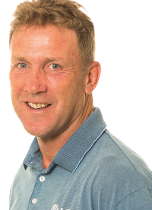 Made his first-class debut for Tasmania in 1978-79 at the age of 17 and retired from all levels of cricket at the end of the 1999 English County Championship season with Durham scoring 23,413 first-class runs with 68 centuries and 114 half-centuries. He also served as General Manager - Cricket at Cricket Tasmania, and as an Australia national selector. Enjoyed a successful Test career with England playing in 25 matches. 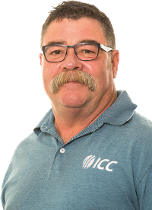 He became an ICC Match Referee in 2003. Was inducted into the Emirates Elite Panel for ICC Referees in 2004 and has refereed in all of the ICC's major events since including ICC CWC 2011. His son Stuart is a cricketer for England, while his daughter Gemma has also worked as a member of England's backroom staff. Played 39 Tests for New Zealand, including six as captain. Captained New Zealand at the ICC CWC 1987. Made his ODI debut as a match referee in April 2004 in the West Indies v England match. He is the elder brother of Martin Crowe, who was Player of the Series at the ICC CWC 1992. His interests include travel, golf, architecture and landscaping. He was one of the five match-referees at ICC CWC 2011, including the final. Played 21 Tests and 63 ODI games for Sri Lanka. 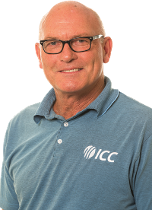 Became an ICC Match Referee in December 1993. 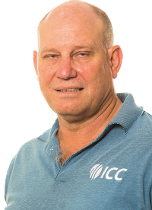 Promoted to the ICC Chief Referee in 2001. Officiated the ICC CWC final in 1999 and 2003. He was one of the five match-referees at ICC CWC 2011. His interests include tennis, reading and watching current affairs programmes. Played 86 Test matches and 224 ODI games for West Indies. Played in the ICC Cricket World Cup in 1987, 1992 and 1996. Captained West Indies in 24 Tests and 87 ODIs. 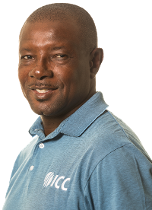 Served as the West Indies team manager from January 2011 to January 2016. 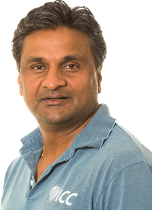 Played in three Tests and 20 ODI matches from 1983-92 for Zimbabwe. Joined the Emirates Elite Panel for ICC Referees in 2009. He oversaw his first ODI in May 2009 between England and West Indies. His interests away from cricket include sports, fishing and reading. Made his Test debut for India in 1991-92 and played 67 Tests taking 236 wickets and 229 ODIs taking 315 wickets. He became the fastest bowler to take 100 ODI wickets, reaching the mark in three years and 19 days after his debut in 1992. Played 34 ICC CWC matches as a player and is the third-highest CWC wicket-taker of all time with 44 wickets. 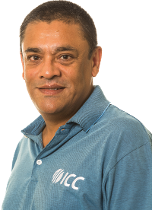 Became a member of the Emirates Elite Panel of ICC Match Referees in 2006, the Test series between Sri Lanka-South Africa at Colombo in July 2006 being his first. His ODI debut came in December 2006 (New Zealand v Sri Lanka at Napier). He also officiated at the ICC CWC 2007 and the ICC U/19 CWC 2008. His interests away from cricket include reading and charity work. He holds a Bachelor of Engineering degree in Mechanical Engineering.